Cotton Jones create music that sounds old and lived in: times spent wandering the backroads, the highways and byways, of America; times spent alone in the wilderness; times that seem out of our time and summoned from the past. Yet even though they are extraordinarily underrated and at the outset placed in the genre categories of "lo-fi", "indie folk", and "alt. country", they transcend these boundaries and are a rarity for our generation: a band which wears its heart honestly on its sleeve and stands on the shoulders of giants but does not steal from them like the majority of contemporary groups. They listen for inspiration in the dusty grooves of old records but their sounds are spontaneous and seem fitting for our era and generation. On Paranoid Cocoon, a mellow moodiness and misty melancholy pervaded the album. These were songs for a late night loner. As frontman Michael Nau sings in the closing track ("I Am The Changer"), "I'm always a stranger." But the band showed they were so much more than just another lo-fi/indie folk/alt. country one-off with the deep atmosphere which seeped into every corner of the record--the spectrum ranged from bluesy, organ-driven opener "Up A Tree (Went This Heart I Have)" with a jazzy trumpet coda and spooky nocturnal voyage "Gotta Cheer Up", which sounded like the lost soundtrack to the riverboat scene in Night of the Hunter, to early morning rainy day meditations "Some Strange Rain", "Gone The Bells", and "By Morning Light". If Paranoid Cocoon was, as the title suggests, about isolation and not feeling like you belong, hearing the train calling you off to distant lands, as the foreboding lyrics of wanderlust anthem "Up A Tree" give voice to, then Tall Hours in the Glowstream is about finding that sense of home and hospitality, even if only for a short time, even if the ghosts of your memories continue to haunt you and bring you to tears and despair. Tall Hours in the Glowstream shapes this fascination with the past, with nature, and with instrumental atmospherics into an even more dazzling and diverse experience. 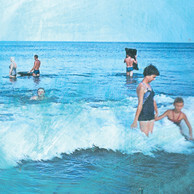 Oceanic imagery is a recurring theme throughout the album, evident on the cover and in the lyrics: "It comes to me like sunbeams on the water", "Let the river roll on", "How sweet it would be to roll up on your shore", "Where the moon dripped milk beside the sea." From the shimmering swoon of Nau and wife Whitney McGraw's intertwining vocals on opener "Sail of the Silver Morning" through the marching beat and fin-de-siecle waltz coda of "Glorylight and Christie" to the crystalline choral vocals of "Soft Mountain Shake" (which condenses the mountain magic of Fleet Foxes) and the horn-driven instrumental "Goethe Nayburs" (which sounds like a missing Morricone cut), Cotton Jones are certainly not in sophomore slump. Perhaps the standout song on the album, "Place At The End of the Street" best epitomizes their special evocative quality. Both personal and universal, the place is anyplace, another bored and restless night "waiting for something to do." Everything changes, of course, when love enters the scene. The poetic lyrics of the "wild exploding moon" and Nau meeting his lover in the morning on the banks of the glowstream are elevated to ecstatic heights by the perfect balance of folky jangling reverbed guitars, celestial vocal harmonies, and that classic rock'n'roll dreamscape. It is truly cosmic American music.